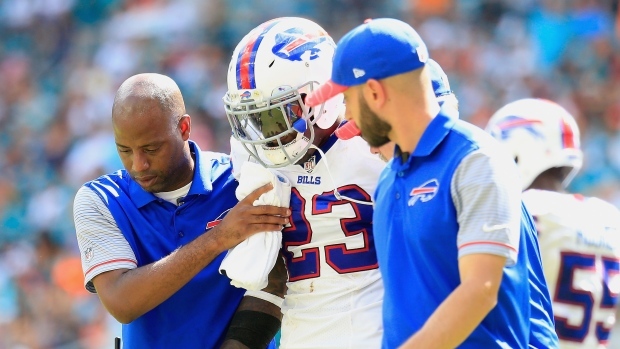 ORCHARD PARK, N.Y. — The father of Buffalo Bills safety Aaron Williams says his son intends to wait until the off-season to determine whether to continue playing after sustaining his latest neck injury. Anthony Williams told The Associated Press by phone Thursday that while the topic of retirement has yet to be discussed, he intends to involve his entire family in a discussion regarding his son's future. "We'll wait to talk about that at the end of the season as a family and we'll pray about it, and make the best decision that's right for him," Williams said. He added he's confident his son has plenty of opportunities beyond football should he elect to no longer play. Williams spoke after his son was blindsided and bowled over by a hit from Dolphins receiver Jarvis Landry in a 28-25 loss at Miami on Sunday. Landry was penalized for unnecessary roughness after he launched himself and caught Williams in the head while blocking on a running play. The Dolphins receiver was fined $24,309 for an illegal crackback block, two people familiar with the situation said Thursday. The people confirmed the fine to The Associated Press on condition of anonymity because the NFL had not yet announced the fine. One of the people said a letter disclosing the fine was sent via email on Tuesday to Landry, his agent, the Dolphins and the NFLPA. Williams was taken to the hospital for evaluation, but cleared to travel home with the team. Coach Rex Ryan on Thursday would only say that Williams is out indefinitely, while adding: "I don't think there's any doubt there's some long-term concerns there." Cornerback Stephon Gilmore told the AP that Williams was experiencing numbness in one of his arms. The team and Williams' father would not confirm what Gilmore said. Anthony Williams would only say doctors ruled out a concussion and that his son is experiencing soreness in one of his shoulders. He also said his son's mouth was bloodied after the hit because he bit the inside of his cheek. Williams was moving to his right following the path of running back Jay Ajayi when Landry struck him. Ryan called Landry's hit "dirty" and "deliberate," and questioned why the receiver wasn't ejected. Anthony Williams also called the hit dirty because of the way Landry launched into his son. Gilmore said Landry's hit dirty, especially coming against a player who has a history of head injuries. Last year, Williams hurt his neck while diving headfirst in an attempt to tackle New England receiver Julian Edelman. Williams missed the final 11 games and had neck surgery, during which doctors shaved two disks to alleviate nerve damage. Williams said he elected to continue playing after doctors assured him there was no increased risk of reinjury . He also missed a portion of training camp last summer because of a concussion sustained when he collided with receiver Dezmin Lewis. Williams has been a starter since being drafted by Buffalo in the second round in 2011 out of Texas. He began as a cornerback before switching to safety in 2013. Buffalo (4-3) hosts AFC East rival New England (6-1) on Sunday. NOTES: Running back LeSean McCoy's status is uncertain after he missed his second straight practice with an injury to his left hamstring. ... Defensive tackle Marcell Dareus is on track to make his season debut after missing the past three games with a hamstring injury. Dareus sat out the first four games serving a suspension for violating the NFL's substance abuse policy. ... Guard Richie Incognito did not practice Thursday because of an illness. AP Pro Football Writer Barry Wilner in New York and AP Sports Writer Steven Wine in Miami.